good-morning-pancakes | Flickr - Photo Sharing! This pic is for Lynn, who also made pancakes last weekend! I used my basic recipe (Cook's Illustrated -- love their books!) and whipped up the whites for fluffier pancakes. Had to do that manually but it was just 4 whites so -- pretty easy. Pre-scooped the whipped butter at home and froze overnight for easy transport in the coolers. Of course once we got there it was moved to the refrigerator! Me in the middle, Sunshine Hanan, and 73 other people added this photo to their favorites. tednmiki: There are heavier ceramic plates but for eating outside we used the melamine? heavy plastic ones? with summer-y prints, this is the print I like best hehe. 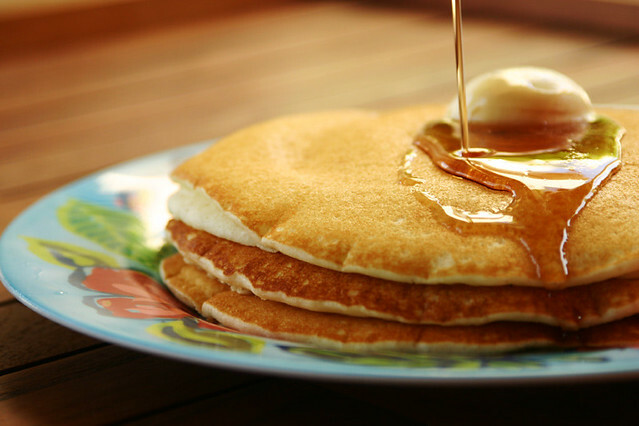 I'm thinking I'm addicted to looking at gorgeous pancakes' photos! how do you get them to come out so beautiful lol? when i make mine they come out lookin black in a bunch of different places. Thanks minimommyv, I just go medium heat and use a clean pan that I wipe with a buttered paper towel, maybe that picks up the pancake batter pan residue? i'm filled by just looking at it. Yummmmm. I added this to my splurge. I hope you like it, and don't mind your pic being in there! Great photo. I used it on my mom's blog post about pancakes! Hi. I hope you don't mind. I have used this photo to illustrate a short story I wrote. It is linked to this photo page. Your photo is almost good enough to eat. The pancakes are light looking with just enough of a tan, and pouring the syrup makes it so right. Also the setting, using that attractive plate...caps it all. Hi, I'm an admin for a group called MAD ABOUT PANCAKES, and we'd love to have this added to the group! this looks delicious! saw it posted today on apartment therapy's "the kitchn" thought you might want to know :). amazing food photos!